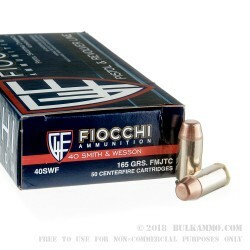 Your target shooting and match participation will be greatly enhanced when you load up with these .40 S&W rounds from Fiocchi. 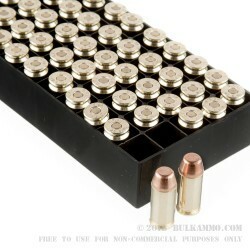 Each of these cartridges houses a lightweight, 165 grain projectile which offers manageable recoil alongside a flat flight trajectory resulting in a steady relationship between point-of-aim and point-of-impact. The bullet uses a full metal jacket shape with truncated cone (FMJ-TC) profile for smooth feeding with a focus on range work. The FMJ-TC's flat nose cuts clean holes in paper and cardboard targets for easy group measurement and a greater degree of perforation crossover between IDPA or IPSC scoring zones. 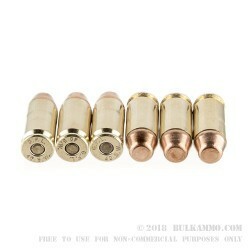 The rounds also utilize high grade components including reloadable brass casings and non-corrosive Boxer primers for dependable function with every trigger pull. 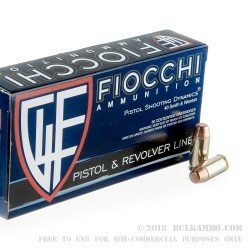 Fiocchi has over a century of experience in component and ammunition production and is headquartered in Lecco, Italy where they share a space with some of the world's most prominent firearms manufacturers. Most of their pistol ammunition sold in the U.S. is manufactured here too and subjected to stringent quality control for flawless performance.